Khon Kaen will open a green market this Friday, November 7, from 3 – 7 p.m. at Bueng Kaen Nakhon near the Bua Luang Restaurant. Teerasuk Teekayupun, the mayor of Khon Kaen, is set to speak at the opening of the market. Government and public health officials, NGOs, farmers, and other interested parties have spent the last two months planning for the Khon Kaen Green Market. Despite being one of the ‘Big 4 Cities of Isaan,’ Khon Kaen is still lagging far behind its smaller counterparts in other Northeastern provinces when it comes to providing people with fresh organic produce. Until now, local organic produce has only been available through small independent sellers, at TOPS Supermarket, and at green markets in nearby provinces. The market will contain several zones, including an education zone, a fresh produce zone, and a ready-made food zone. Currently, there are 67 booths registered to sell; vendors will be coming from Khon Kaen and surroundings areas, as well as Mahasarakham and Phetchabun. See the Facebook page for directions to the market. MAHASARAKHAM – In 1996, a group of government officers from the Agricultural Land Reform Office (ALRO) proposed an alternative to the reigning model of chemical farming. Buoyed by their idealism and Japanese funding, they initiated a pilot program that trained and established a small network of organic farmers. The result is a community of 900 farmers in four Isaan provinces who now farm a far greater diversity of crops, reject agrochemicals altogether, and are equipped with the skills to package and market their organic goods locally. KHON KAEN – The floodwaters have receded, the fields are cleared, and Udom Phanprasri spends his week transplanting his new rice stalks in straight lines across his muddy plot. Neighbors drop by and watch quietly as he sinks the stalks one by one. In Yangyong village, Mr. Udom is well known for his mastery of farming and villagers often ask to learn his techniques. But while his neighbors are eager to learn his tricks, none have followed suit in his most important decision. Unlike the rest of his village, Mr. Udom embraces organic practices in his farming. The remaining 60 farming families still prefer a far more popular method that relies heavily on agrochemicals. Mr. Udom transplants his rice with his wife. 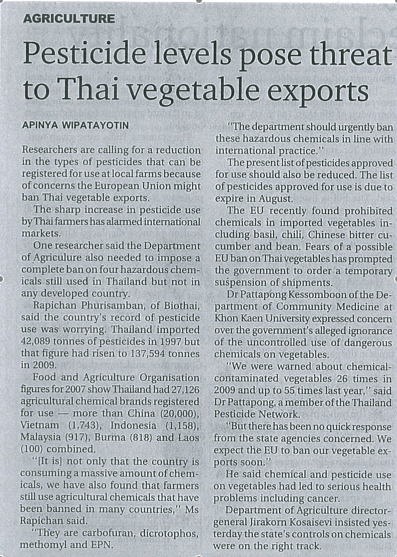 Since the 1960s, the use of agrochemicals in Thailand’s agriculture sector has skyrocketed. According to Greenpeace International, an organization that campaigns on environmental issues, Thailand’s farmers have increased their use of chemical fertilizers by a multiple of 94, from only 18,000 tons in 1961 to nearly 1,700,000 tons annually in 2003. The nationwide yield of rice has barely doubled. This staggering increase in chemical fertilizer coupled with a relatively low gain in crops has led many to worry about possible impacts of chemical waste but has convinced very few farmers to go organic. Excessive or misused chemical fertilizers can threaten farmers’ health and often deplete the quality of the land. Farmers and experts agree that organic farming remains unpopular mainly because there is no international market for organic produce from Thailand. While the popularly exported jasmine rice can be sold to the government for 20,000 baht per ton, a price nearly double market value, other rice strains that are used in organic farming are not supported by government insurance schemes. Organic farmers like Mr. Udom are left with little choice but to sell their rice to private millers who often undervalue the product. “The local government officers tell us not to use chemical fertilizers. But when we try to sell to the government, they prefer to buy rice that has been chemically treated,” Mr. Udom complains. Enticing farmers to turn organic is yet another obstacle. With chemical fertilizer, farmers can see positive results of higher yields and healthier plants within the same season the fertilizer is used. With bio-fertilizers, it can take two to three years to see results. The Ministry of Agriculture initiated a project to tackle over-dependency on agrochemicals about fifteen years ago. The ministry employs officers in every province to teach Good Agricultural Practices (GAP), a set of farming standards that encourages a mixture of agrochemicals and bio-fertilizers. “In the past, farmers used only agrochemicals. It’s our duty to reduce the use of chemicals and encourage bio-fertilizers. The results show that a mixture is better than just one or the other,” says Amphon Sirikham, an agricultural specialist for the Ministry of Agriculture. Nevertheless, in recent years, imports of pesticides have surged from 42,000 tons in 1997 to 137,000 tons in 2009. Mr. Amphon estimates that in Mr. Udom’s sub-district, Kok Si, about half of the farmers use only agrochemicals and the other half now use a mixture of chemical and bio-products. The switch to organic farming is very rare. Networks of organic farmers are sparse in Northeast Thailand. The largest network, the Alternative Agriculture Network, is in Yasothorn and Surin and smaller co-ops are scattered throughout other provinces. KHON KAEN – As the Pheu Thai government launches its rice mortgage scheme today in 31 provinces, experts fear that the new policy will offer little benefit to small-scale farmers and instead invite increased graft and corruption among millers and national politicians. Many of Thailand’s rural rice farmers, on the other hand, commend the policy as one that actually helps discourage corruption at the village level. Today, these farmers welcome not only a promised salary increase, but also a pro-business policy that they believe better rewards hardworking farmers and enables informal laborers to reap increased benefits. The campaign promise of Prime Minister Yingluck Shinawatra won the hearts and votes of the rural constituency much as it had for former Prime Minister Thaksin Shinawatra, Ms. Yingluck’s older brother. Ms. Yingluck’s policy raises the price of rice nearly 50 percent, offering farmers mortgages of 20,000 baht for one ton of unmilled jasmine rice and 15,000 baht for one ton of unmilled white and sticky rice. Under Abhisit’s price guarantee policy, landowning farmers could register with the Bank of Agriculture and Agricultural Cooperatives (BAAC) as soon as they had planted their rice. Government representatives from the bank would calculate the landowners’ expected rice production and later pay the landowners the difference between the market value and the government-guaranteed price. Though representatives of the BAAC claim that farmers’ paddies were frequently monitored, the farmers of Ban Yan Yong village in Khon Kaen talk openly about how trickery and corruption at the village level were par for the course. Ms. Jongkolrat Kanruensri, the manager of the Khon Kaen branch of the BAAC, recognized this tendency, as well. “Under Abhisit’s plan, people with mortgages often didn’t have as much rice as they claimed they did,” she said. Many villagers complain that landowners would bribe or beg neighbors to falsely vouch for how much rice they had planted. With signatures of witnesses, the landowners could trick government representatives by under-planting on their fields, poorly tending to their rice plants, or claiming floods ruined land that had never even been seeded. Ultimately, landowners were often rewarded for the number of rai they owned and not for the amount of rice they actually harvested. “I thought Abhisit’s policy was good because the government subsidized us just for being rice farmers. But it was bad when people started taking advantage of that,” said Mrs. Nongyao Reuthaphrom, a 27-year-old sticky rice farmer. Under Pheu Thai’s new mortgage policy, farmers are rewarded with a loan only after they have harvested their rice. This way, villagers argue, landowners cannot lie about how much rice they are producing. Somporn Isvilanonda of the Knowledge Network Institute of Thailand (KNIT) explained in an e-mail interview that he, like most academics, is more concerned with the opportunities for corruption in Ms. Yingluck’s plan than he was in Mr. Abhisit’s. Instead, Mr. Somporn believes that poorly regulated rice millers now have a greater incentive to replace good quality rice with poor quality rice. In the new policy, national politicians who are assigned to specific mills are each asked to meet a certain quota of rice. This mandated relationship between the millers and the politicians, the National Rice Committee member argues, can also lead to increased corruption. Ban Yan Yong farmers, however, are less concerned about corruption that occurs at the mills and more concerned with the ways in which this policy brings fairer pay to its community members, most of whom farm on rented plots from wealthy landowners. According to a 2011 World Bank report, Thailand’s informal agriculture workforce stands at 14.4 million people. Under Abhisit’s price guarantee policy, landlords could exploit millions of these farmers because it was the landlords, and not their tenants, who directly received the price difference between the market value and the guaranteed price. Now, it is hoped that the renters will have more leverage. “If people were honest all of the time, Abhisit’s policy would work. But people aren’t honest,” said Mr. Somjai Reuthaphrom who rents five rai of land from one of his neighbors in Ban Yan Yong village. Mr. Somjai has seen many of his renter friends weather plummeting incomes under Abhisit’s administration. Greedy landlords chose not to pay their renters the difference between the market price and the guaranteed price that they had received from the government. With Pheu Thai’s policy in place, Mr. Somjai and others believe that the informal agriculture sector will see far greater rewards. As the guaranteed price of rice rises, land renters’ salaries should increase as well. Pheu Thai’s rice mortgage policy is scheduled to run through February 29, 2012. Sunday's forum brought together NGOs, activists, and politicians to discuss Baw Kaew's future. Baw Kaew's greenhouse is one of many sustainability efforts. Their seed bank carries 122 seed varieties of rice, vegetables, and fruit trees. Villagers now sell goods made from locally grown cotton. CHAIYAPHUM – The sound of mor lam music, traditional to Northeast Thailand, filled the air last Saturday evening as Khon San villagers and friends gathered to celebrate the second anniversary of the founding of Baw Kaew village. In the past two years, Baw Kaew villagers have developed their community, seen success in their battle for a legal land lease, and established sustainable agricultural practices, all amidst a eucalyptus plantation owned by the Forest Industry Organization (FIO). The celebration weekend culminated on Sunday in a forum for various NGOs, activists, and politicians to speak to the challenges of addressing land reform disputes. Baw Kaew was established on July 17th, 2009, 31 years after the state-owned FIO evicted more than 1,000 villagers from 4,401 rai of land to begin the Khon San Forest Project. By the late 1980s, the FIO had cleared the land in order to plant a eucalyptus plantation. After decades of unsuccessful protests for the right to return to their former land in Khon San, 169 displaced families decided to take a new approach. Aided by the Land Reform Network of Thailand (LRNT), these families illegally resettled in Khon San Forest, founding Baw Kaew as a protest village. Rather than only spend their time in front of government buildings, villagers believed they could also stage their protest directly on the land they used to call home. Their efforts have been met with both new obstacles and successes. One month after they founded the village, 31 residents were charged with trespassing on state-owned land. By April 2010, the court had ruled that villagers needed to move out. However, this past fall, Baw Kaew villagers began to see progress. The Working Committee on Community Land Deeds, set up under the Abhisit administration, approved 35 villages to pursue community land deeds, including Baw Kaew. So far, only two communities have been granted deeds, which leaves Baw Kaew and 32 other villages still on the slow path to gaining legal access to the land they currently occupy. In Sunday’s forum, Prayong Doklamyai of the Northern Development Foundation emphasized the gravity of land rights disputes in forests across Thailand. “There are about 10 million Thais in state forests that cover around 20 million rai of land. This is a time bomb waiting to explode,” he said. Mr Prayong believes that while there has been an improvement in the policy of the last government, implementation has not followed suit. In response, Secretary to the Prime Minister’s office Phubet Jantanimi insisted that the government is doing the best it can. “The government has already agreed to give the land to the people [of Baw Kaew]. But the government can only ask for the cooperation [of the FIO], it cannot give a direct order,” he said. This has led to confusion and frustration among Baw Kaew villagers. While the Working Committee on Community Land Deeds has encouraged villagers and the FIO to resolve their problems, the central government says it does not have the authority to enforce state-owned agencies to follow its mandate. This year, the committee ordered the FIO and the government to survey the land that Baw Kaew has requested. But until the FIO agrees to relinquish the land, villagers are left waiting with little control over the timeline or outcome. Mr. Pramote of the Isaan Land Reform Network, however, does not believe the government is powerless to end FIO projects. He claims the government pays the FIO approximately 1.2 billion baht, or about $40 million per year. “If the government is sincere and has the courage, it can force the eucalyptus forest to be abolished. It has already happened in other areas,” he stated. As community members wait for the FIO to cede the land, villagers have moved away from only fighting for legal tenure and are now developing the sustainability of their community. According to Mr. Pramote, the current eucalyptus plantation is not sustainable. “Since the eucalyptus trees grow really fast, they draw a lot of nutrients from the soil,” he explained. In order to combat the negative environmental impacts and restore the soil, farmers have been planting local vegetables and herbs between the uniform rows of eucalyptus trees. In May of this year, the community also established a local seed bank in their village. They hope that it will help preserve their local knowledge and prepare them to cultivate the land once a land deed is granted. Though Baw Kaew villagers’ strategy now focuses on developing a sustainable community, their options are limited without a concession from the FIO. Until the eucalyptus trees come down, villagers will continue to live in protest for their former land.